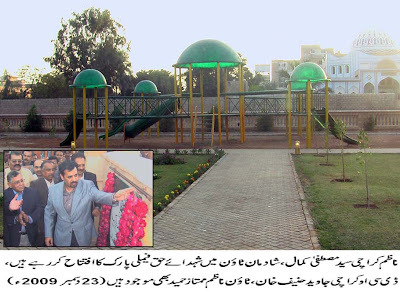 City Nazim Syed Mustafa Kamal inaugurated Shuhada-e-Haq Model Family Park in UC-8 of North Nazimabad Town on Wednesday. Town Nazim Mumtaz Hameed, member Sindh Assembly Abdul Moeed Siddiqui, DCO Karachi Javed Hanif Khan and Executive Director Parks & Horticulture Liaquat Ali Khan were also present on this occasion. City Government has constructed this 4 acre park with a cost of Rs20million. On this occasion while talking to media representatives Nazim Karachi said that this is the 350th park that has been constructed by present City Government in Karachi. He said that the availability of 350 small and big parks and a good number of sports grounds has led to considerable reduction in the air pollution and the citizens have got better and quality recreation facilities near to their homes. He said that we have completed thousands of projects during last four years while hundreds of other were still in pipe line and would soon come on the ground. 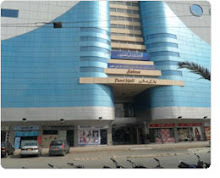 City Nazim said that development was an ongoing process and it never ends at any point. Adding that the present development process in city must continue or the whole nation would have to bear the brunt of its stoppage. Nazim Karachi said that despite of completing thousands of projects in last few years we believe that not all the problems of citizens have been solved and still we have to do lot of work. He said that city government has constructed many huge and small parks in the city including Bagh Ibne Qasim, Beach Park, Jheel Park and Shaheed Benazir Bhutto Park that would surely provide good recreation facilities to people. He said that while doing so many works in Karachi we never considered the affiliation of locals to any particular group or party. Besides main city areas, katchi abadies, rural areas and islands were also given equal importance in the journey of development. He also cited the example of Manghopir area where city government has upgraded its old Leprosy Hospital to a modern general hospital with state of the art facilities made available for patients living in that vicinity.